Search the library catalogue, access your library account and renew your library books on-line, browse digitised historical multimedia collections, download eBooks and stay connected with social media. Read eBooks for free with Highland Libraries, select up to 5 eBooks to download at any one time. We currently have over 2,500 fiction and non-fiction titles available to download. Zinio lets you read full digital copies of your favourite magazines for free on your computer, tablet, or Smartphone. Read local and national newspapers and magazines from around the world on the day they are published for free with PressReader. Access over 1000 best selling audiobooks to listen to on your computer, MP3 player, tablet or mobile phone for free! Search for books, DVDs and magazines, renew your loans, place reservations, and update your account details online. Please login with your 14-digit barcode and 4-digit PIN number. Access up-to-date local, national and international information resources and advice for FREE. As a member of the library service you have privileged access to a range of premium subscription resources. The libraries app helps you get more from your library service on your mobile devices. Manage your account, search the catalogue, renew and reserve books and items. To login please use your library number and PIN. Free access to over 1.5 million academic articles and research on subjects including art, architecture, business, engineering, history, languages, politics, philosophy, mathematics and the sciences. Exclusively accessible on library computers. 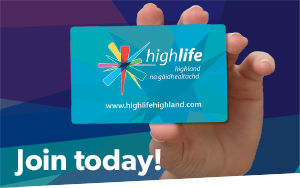 Join High Life Highland Libraries’ online community to receive regular updates on library events, new books, fun facts, and interesting images. We welcome you to share your views, book reviews and comments online. Presenting the culture and heritage of the Scottish Highlands and Islands in English and Gaelic language. Am Baile has digitised tens of thousands of items from archives, libraries, museums and private collections. A video-based how-to training resource, Atomic Training opens up unlimited access to thousands of short videos covering more than 500 of today’s most popular software applications on both PCs and Macs.